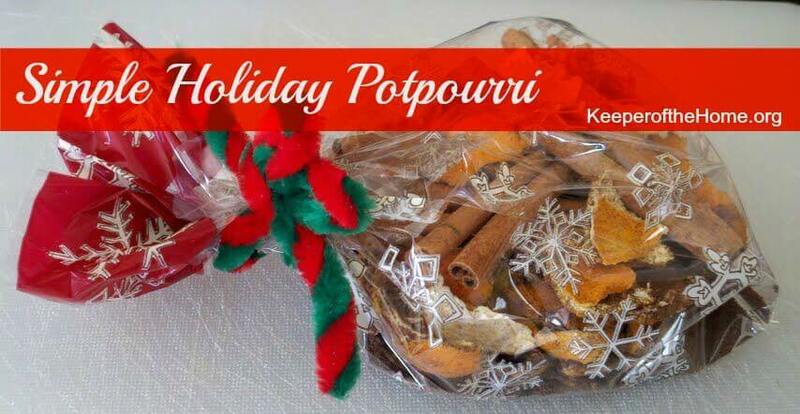 It’s so easy to make your own potpourri, and it’s such a fun and inexpensive gift. 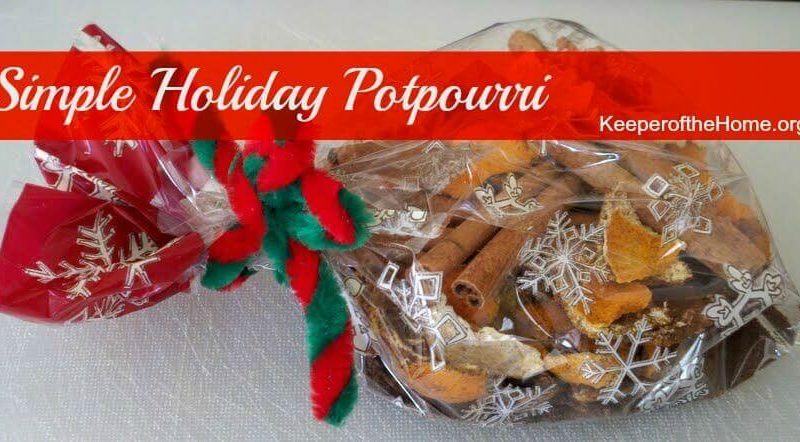 Make up a small batch of this orange spice holiday potpourri and keep it in your kitchen to simmer any time you want a fresh, festive scent in your home. Or make a big batch to make several small gifts for anyone on your list. Buy small, holiday treat bags with ties, or you can use pretty sachet bags then fill with potpourri and tie with ribbon or raffia. Attach a homemade gift tag with simple instructions (simmer 1/4 cup potpourri in 1 cup water) for an added touch. Simmer one tablespoon plus 1/2 cup water in small pot or potpourri warmer. Planning for a homemade Christmas? Look forward to more homemade gift tutorials over the next couple of weeks! What’s your favorite homemade gift? Do you have a ratio that you generally use for the ingredients? Also, how do you dry the orange peels? Yeah, I was wondering the same thing… do you buy orange peels or do you dry them yourself? I assume if you had a dehydrator you could dehydrate them. Can you dry them in the oven. I’m looking for some inexpressive gifts for some moms who have been watching my children a few times a day. This seems like a neat gift, something a little different that can make your house smell homey. Really? The next day? That sounds too good to be true! Great idea! We do homemade gifts every year (with my side of the family). Some of my favorites have been homemade laundry soap, coasters, family calendars, framed shadowboxes, etc. Makes Christmas SO much more enjoyable!! We love it! This is a great idea. I usually just use cloves and cinnamon sticks. The allspice should make it smell even better! I think this is a great idea! The favorite gift I made was a journal for a friend. I made the paper from recycled junk mail, used cardboard boxes and scrap fabric and ribbons for the covers, and sewed the binding. My friend loved it, and my mom has asked me to make one for one of her co-workers this year. It takes a little time, but they turn out adorable! This is a great gift idea! I do this on the stove, but don’t always use the same ingredients and surely never thought to give it away as a gift! Hmmm that is something for me to remember here! I’ve made this for years for myself and to give away. Sometimes I add dry apple peel. I’ve even used it to make spiced apple cider. Just put some in an infuser, drop it in the apple cider on the stove and let it steep for several hours. Can’t wait to try this! I can already smell it! So, dumb question, you put the whole thing (all the orange peels in spices) in that amount of water? what a fabulous idea– particularly for teachers who might be on homemade cookie overload!! i love things like this where measurements need not be precise, so little hands can get in on the gift making. thank you for sharing this idea!! Yes, I will definitely try this. I’ve made a habit of saving my orange peels in the freezer to simmer on the stove with cinnamon and cloves, but I’ll have to try the traditional, dried potpourri. I have some of this going right now, Brandy – it smells amazing! I’ve done this with spices before, but the dried orange peels really add a special touch 🙂 Great idea! I usually use pickling spice too which adds to the smell of this. I love making this every Christmas holiday. I have a mix I bought but no fruit on hand can I use that now and ad fruit later?